Two books from October 29, 2014. Plus a Second Opinion, featuring questions answered by a different listener each week, with Joe Patrick. 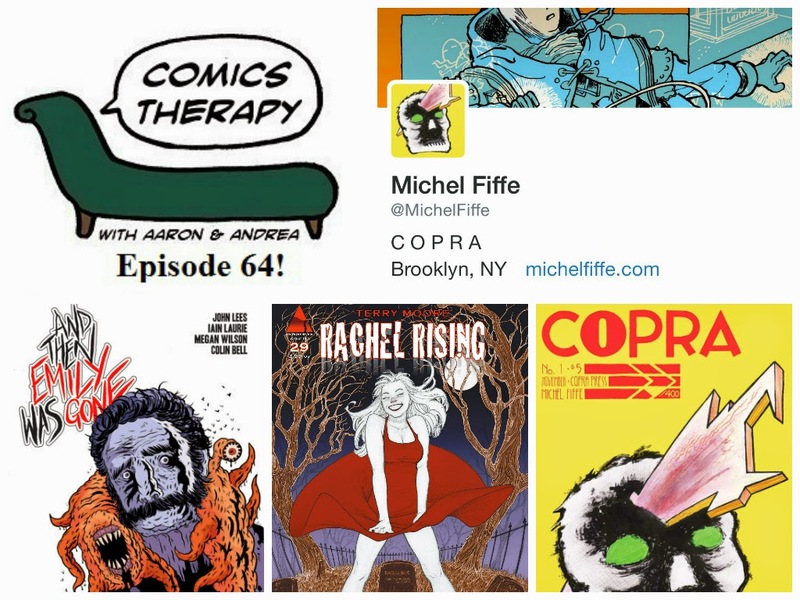 On The Couch: artist and writer Michel Fiffe. Happy Halloween! No, for real. It is Halloween right this very second, and we are happy and you should be, too. (Sure, now that this is posted it's actually November, but in the moment let us celebrate October with one final round of horror comics.) This week’s theme is creepy children. Some of the scariest books, movies and comics we’ve ever seen or read have involved kids who are either not all there, or not what they seem or just...not. These two books do their part to add to this delightful niche in the genre, where children aren’t a source of joy or peace or love, but in fact something to fear or fear for. Missing children. Children who keep demons away. Boogeymen who take children. Parents who miss children. Hit men who kill children. A child destined to bear Satan's heir. A child who kills, repeatedly. Happens to be the same child. Michel’s critically acclaimed self-published series Copra was on a number of best of lists last year, and Round One, collecting the first six issues, was recently published by Bergen Street Press and is available through Diamond for the first time. He is also currently writing All-New Ultimates for Marvel Comics.